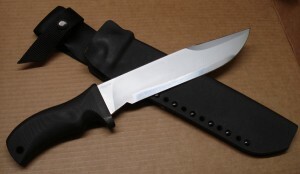 Military versions of the Para Raider included a razor-sharp upper edge on the forward third of the knife instead of the false or unsharpened upper edge of civilian knife styles. Either type provides plenty of thick knife spine for safe thumb leverage. The bright chromium coating protects the steel from corrosion, but this isn't a compromise knife made from high carbon stainless. Under that protective layer, you'll find high carbon tool steel tempered to Rockwell 62 on the edge and Rockwell 50-54 on the spine and tang. That provides a cutting edge that stays razor sharp and holds up to heavy cutting without damage, along with tensile strength in the main body of the blade and tang that absorbs shock and leverage pressure. Fourteen inches long with a 9-inch plain-edged blade, the Para Raider's 1/4-inch thick steel gives it pry bar strength but a total weight only slightly over 16 ounces. The Raider's epoxy and glass fiber handle withstands chemicals and extreme heat as well as heavy impact. Built for a firm and comfortable grip, the deep finger choil and distinctive shape allow correct orientation of the blade even in complete darkness. To further protect the user in urban survival situations, the knife uses a fully-enclosed tang design to isolate the knife owner electrically. If the blade contacts a live wire while chopping through wreckage, the insulating handle prevents electrical shock. The Para Raider's Kydex belt sheath was individually handmade, like the knife itself, and includes a safety strap to keep the knife in place in any situation. See the Puma IP Combat Dagger for another high quality knife intended for the military user and the collector.